Interested in business branding, marketing or advertising design? “Working with Devika on my wedding invitations was such a wonderful experience. I had a general idea of what I wanted my invitations to look like and Devika worked very closely with me to ensure that my vision came alive. Her invaluable insight, guidance and natural talent turned my invitations into works of beauty! Devika has a truly exquisite style and I feel so lucky to have worked with her.” – Julia S.
“It’s a rare quality in a creative designer to care so deeply and make so personal their professional endeavors, but Devika does just that. Not only is she talented and imaginative, she takes such pride in her work. Quality is never compromised, corners never cut. Working with Devika, I felt that she was just as invested in my wedding invitations as I was! That doesn’t often happen when dealing with other designers. She truly made it her mission to create the most beautiful pieces, never straying from my theme and always including me in revisions and discussions about the next steps. I think the best part about working with Devika is her charisma and effervescence. She is a delight to spend time with, in person or over the phone. You feel as though she becomes a friend, and what could seem like “work” or a “chore” turns into a fun project when she is leading it. We all know that, especially where weddings are concerned, as the bride you tend to freak out or get upset and short tempered. But working with Devika, I never felt pressured into anything I didn’t want and I always looked forward to our meetings. I would highly recommend Devika for any creative event or project. I will definitely be hiring her again!” — Brooke N.
“My husband and I were married in upstate New York, in the mountains by the lake, and wanted all of the elements of our wedding to reflect the fun, whimsical, rustic environment and experience that we wanted to create for our family and friends. We brought in Devika somewhat late in the process, and she immediately got a handle on exactly what we wanted. She was able to skillfully merge what we wanted, with some of her own creative ideas to make it even better. Devika is also very detail oriented, which as a bride who was deemed a “perfectionist” by some, was something I really appreciated. Within a few days, she had everything ready and we didn’t have to go through a lot of iterations because she really understood from the beginning. 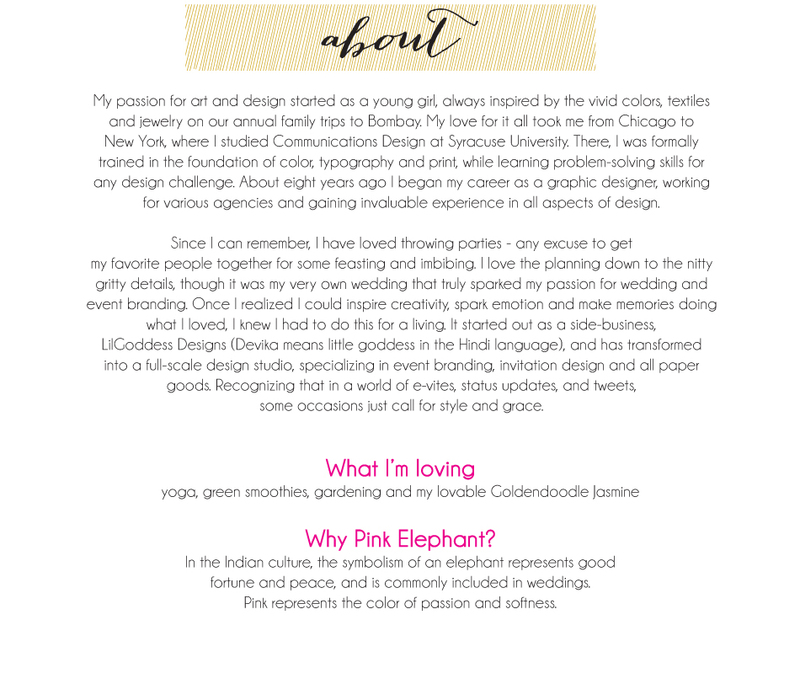 We are so happy we found Devika!” — Allie S.
“I wanted the “awe factor” for my wedding stationery – something unique and stunning. Devika designed the most beautiful theme that was carried throughout all of my different pieces. Many people told me that they had never received an invitation as unique or elegant before! Devika thinks outside the box. She’s also warm and friendly and really cares about your event. I can’t wait to work with her again!” – Sarah W.
“Asking Devika for help on designing our wedding was the best decision we could have made (after saying yes to the marriage of course!). Devika took the time to understand the very little pieces of a “vision” we had to start, sat with us to ask the right questions, and ultimately designed a vision that included a personalized logo (literally as we were sitting with her!) that we ended up using for everything on our special day. Devika helped us make the idea of our wedding become reality – she kept us on track the entire time, always gave us enough notice and extremely responsive when we wanted changes and we couldn’t have asked for a better partner. The best part was that I didn’t feel like she was trying to fit us into an existing template, she wasn’t afraid to start from scratch and she really took the time to understand what was important in our relationship. The hardest part about a wedding is knowing where to start and Devika was our inspiration. Our family and friends will always remember our special day thanks to Devika.” – Kristin R.